Bring your screen to Anna to have it painted. Then opt for convenient payment methods using PayPal. Ask Anna about optional services including custom interior screen art, scheduling pickup/delivery, and re-screening. See pricing for custom framed interior screen art here. Winter is the ideal time to have your screen painted and window-ready for spring! Cost to paint your screen is based on the size & the design of your screen. For an accurate quote, email me your screen measurements (Length x Width) and I will give you a free estimate. I may be able to offer you a special discount. 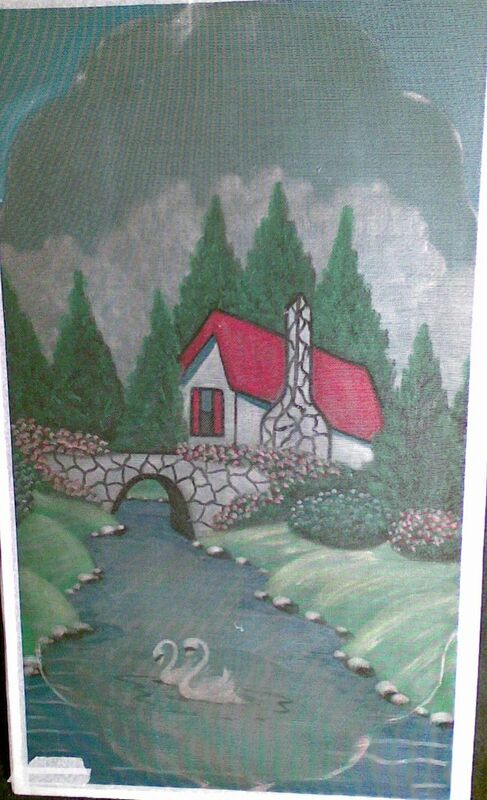 I charge up to $20 per sq ft for a traditional red-roof country cottage scene with swans in a stream, flowers, maybe a bridge. Any other design of your very own choosing is up to $30 per sq ft., effective July 1st, 2011. 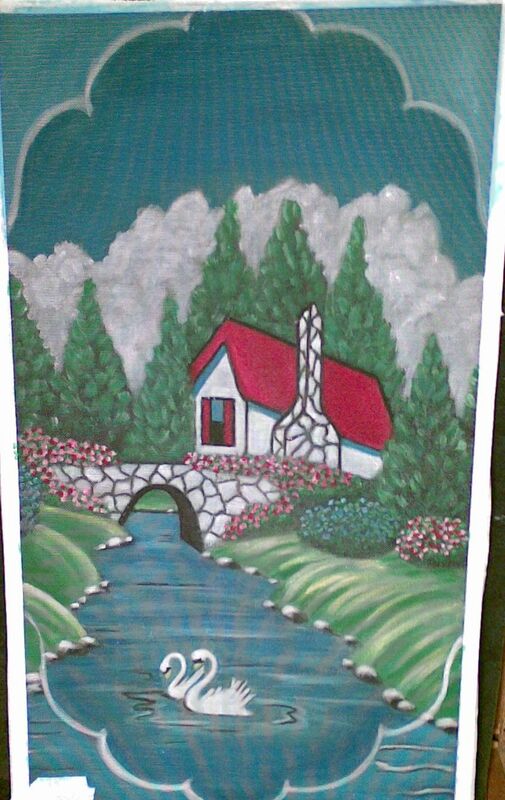 As an example, a 2ft x 3ft window would cost $120 for a cottage scene and $180 for a design of your personal choice. Discounts are often available for larger screens. A 76"H x 36"W sliding patio screen door would typically cost $380 for a traditional cottage scene and $570 for a design of your personal choice minus a LARGE SCREEN DISCOUNT. Please inquire. You may also be eligible for "neighborhood" or other special discounts. 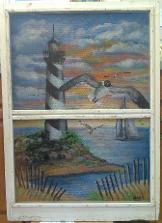 I can paint an unframed screen, roll it up, and ship it to you, adding $30-$45 extra for the screen, tax, and S/H. If you are local or if your window screen is easy to ship, it is better to paint your own framed window or door screen to assure proper fit and design alignment. When applicable, MD State sales tax is included in the pricing. Most any scene or subject you want may be painted on your screens. Choose something near & dear to your heart. Each window screen painting is an original piece of art. Simple compositions can make beautiful, elegant, and bold statements. I will paint whatever your heart desires, but please consider your main focal point and avoid adding too much extraneous clutter that may render your design "too busy." You will receive a free consultation with the screen painter to select YOUR personalized window screens design. The highest quality workmanship and customer service is guaranteed. Your window screens will be painted in the artist’s studio. Allow 2 to 3 weeks for completion. Screens should be clean and in good condition.Label the "outside top"of your screen with tape. Screens may be either Metal, Fiberglass or Pet Screen. Paintings on black anodized or untreated aluminum-metal screens and on pet screen tend to last longer than on fiberglass. I can not guarantee the longevity of the painting on fiberglass screening. If you need to replace your damaged screens prior to having them painted, consider metal or heavy duty pet-resistant screen. Warranties and one-time touch-ups and/or clear coat "winter maintenance" may be included at no extra cost. multiple screen discounts, and more! Be sure to mention if you've seen Anna's Outer Banks Screens while visiting the Pea Island Gallery in Rodanthe or the Blue Pelican Gallery in Hatteras Village to qualify for special offers! 1. Keep in mind that your finished screen painting will show best on a dark background or when the shades or curtains are drawn open. 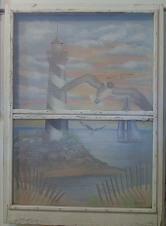 Note the difference window curtains can make in these unretouched photos of the same lighthouse screen painting. 2. Avoid painting roll-up screen doors. The paint may adhere to the screen when stored in its rolled-up position. 3. When using a screen for privacy, select designs with white and bright colors. Black provides no privacy. 4. The privacy effect is lost at night. Screens become "invisible" at night when the interior lights are on. Shades are still required for privacy at night. It's the nature of a painted screen. 5. Please don't be discouraged and sacrifice the artistic beauty of a painted screen just because the painting magically vanishes at night. 6. The screen should be on the exterior of the glass window or door for optimal viewing. Casement and jalousie window screens aren't conducive to traditional exterior screen painting. But, on the other hand, interior casement window screen paintings can create a very different and dramatic effect inside the home when the sun goes down. Restoration & preservation services of historic and treasured screens are available. BEFORE: An older painted screen by Master Painter Dee Herget prior to restoration. AFTER: Colors become vibrant and features become more distinct after restoration. 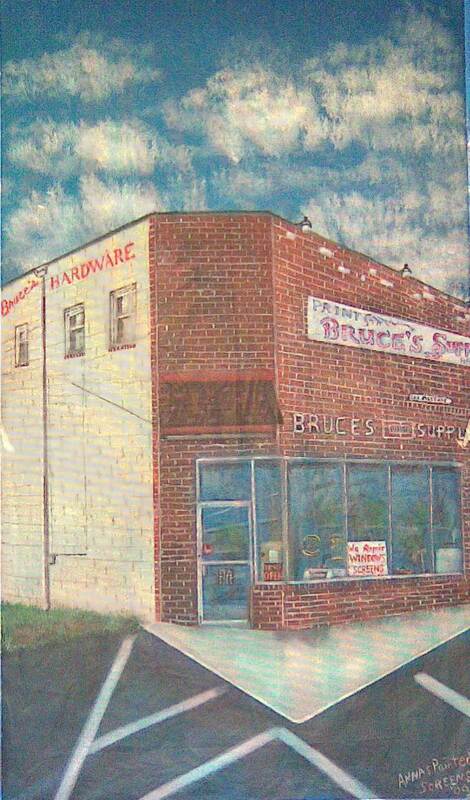 Sadly, our other neighborhood hardware store has closed. GO GREEN with a PAINTED SCREEN!